Green bazaar is the largest farmer's market in Almaty. It is very central, located right next to Zenkov Cathedral (a wooden architectural wonder) and to Panfilov park. With all its special local products (horse meat, local dairy etc.) to me it was one of the strongest impressions of our trip. As you enter the Green bazaar, you see lots and lots of herbs sold in the market, but as you look closer it turns out they have more relation to medical usage than to cooking. Fruits and veggies are also in the front section. They are not exotic, but some (like peaches, melons, watermelons etc.) are just extremely tasty - I don't think I ever tasted something like those in Moscow. Then you can move deeper to the back section of the market to look into horse meat, and then to the left to see amazing local dairy products. Horse meat is something I should start with. Overall it is the preferred kind of meat in Kazakhstan. It is more expensive than beef and lamb and is considered healthier and tastier. The whole back section of the Green bazaar is about horse meat. One of the most popular ways of preparing horse meat is kazy (a special kind of sausage, which is part of traditional beshbarmak noodle dish). This lady, Elemes, located number 1 in row 6 has been a kazy master for 20 years and she kindly explained the process to me. She started from cutting a shoulder part and cut it into long thick blocks. She also cut some horse fat into thinner blocks. During our visit in Almaty everybody would tell me that horse fat is good for you and it is less heavy than that of lamb, so did Elemes. On top of that the fat makes the kazy much tastier. Having done the cutting Elemes arranged the meat and fat to approximately shape the future sausage. She generously salted the meat and fat, covered it with minced garlic and ground black pepper. Than she pulled the guts on and formed the sausage, closing it with toothpicks from both sides. If you are buying fresh kazy as we did, it is meant to be boiled. 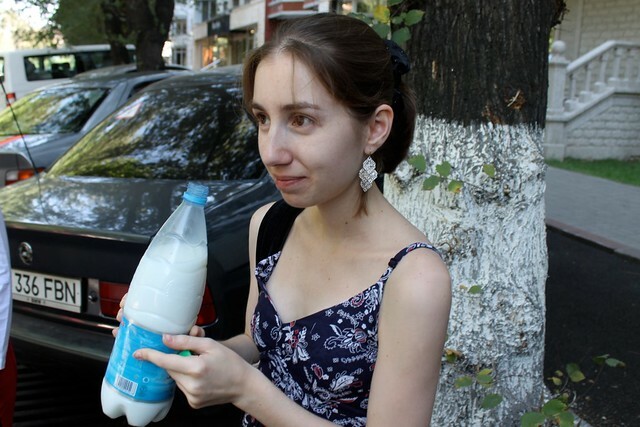 Elemes advised us to let kasy stand at room temperature at least for 4 hours before cooking. If you need to store it longer before cooking it is better to refrigerate or freeze it. Then it needs to be simmered for 3-4 hours to get ready. You can also get some hot or cold smoked kazy at the Green bazaar as well as some other kinds of horse sausages, dried horse meat and smoked horse meat. Sellers will definitely offer you a taste before you buy something and you won't regret tasting. I'm not at all a meat lover, but I was really impressed by how good all those things taste. Local dairy products are also very special. 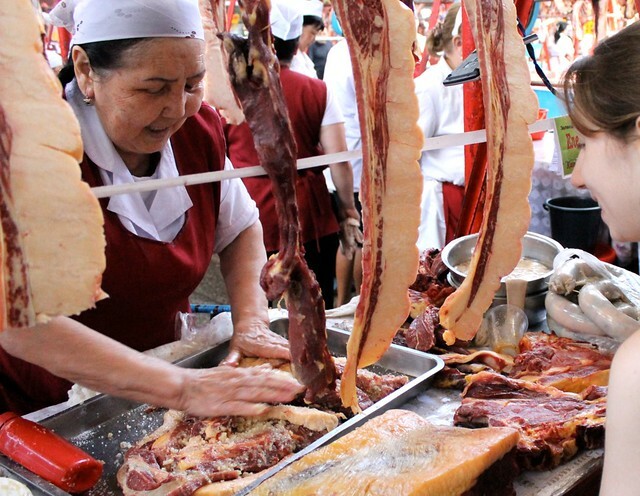 Like the meat preparation methods, many of them emerged because of nomadic life Kazakh people used to live in the past. Many of them can be stored for a really long time (months) at room temperature. Qurt (front row in the picture) is a kind of cheese. It is extremely dry and firm, way firmer than, say, mature parmesan. I wouldn't be able to break a piece of qurt with my fingers, but it is possible to bite into it. Qurt is available salted or unsalted. As far as I got it is mostly eaten as a snack (say, with beer) and rarely is added to some other dishes. Irymshik (back row in the picture) is another popular thing and it is absolutely delicious. It is made of milk, which went sour. The milk is evaporated slowly for a long time till it turns very thick sweetish chewy and yellow. Apart from qurt irymshik has more relation to sweets, sometimes eaten on its own, sometimes used as an ingredient (e.g. those brown balls in the picture are made of crumbled irymshik mixed with condensed milk and something else). Kumis is a drink made of mare's milk. It is quite sour and very refreshing. It tasted amazing to me, especially when it was hot outside. 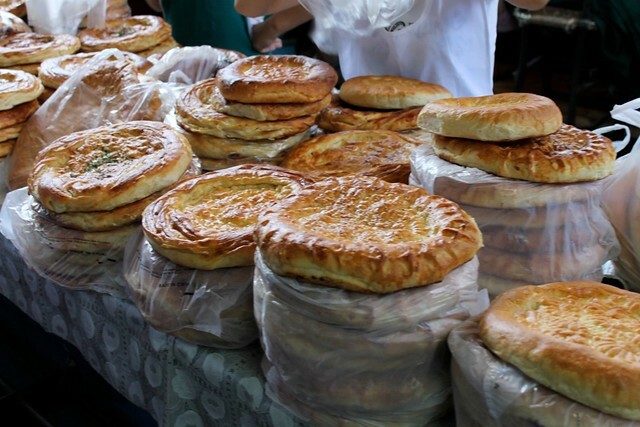 The kind of bread I saw most often in Almaty are these round flatbreads, sometimes plain, sometimes seasoned with herbs. Those we got at Green bazaar were extremely fresh and good. Samsa (samosa) (a kind of meat stuffed pastry popular all around Central Asia) is also available from small pastry shops in the market and around it. Accross the street from the market you will see a very large pale rose building of Rakhat, the national chocolate factory. As we entered its store I felt like I came back to soviet time stores of my childhood. The light blue chocolate bar "Kazakhstansky" is considered the classics of the factory. The locals also really appreciate these 65%, 70% and 80% dark chocolate bars and prefer them to imported foreign brands (for, say, baking purposes). Apart from the chocolate bars the factory, of course, produces all kinds of chocolate sweets. To me they taste similar to those produced by Russian factories. *gasp* Samsa börek! My mother does them for us, but also with BEyaz Peynir & Parsley.